Climbing plants add height interest to the garden, save space and camouflage unsightly areas that detract from its beauty, such as walls, old outbuildings, fences and posts. Trellises or arbors simply cry out for foliage and blossoms, making them ideal supports for morning glories, ivy or clematis. Climbing plants also provide privacy and shade if planted along the southern side of an open porch or deck. Climbing plants use one of three methods to climb: using hooks that grow from the sides of their vines to latch onto other plants; attaching themselves to other plants and supports using small threadlike growths called tendrils; and by twining themselves around other plants or supports. Some vines, such as ivies, send out tiny rootlike shoots coated in a sticky substance that allows them to stick to smooth surfaces such as siding and stones. Not only are climbing plants attractive when growing on walls or trellises, they also do well in hanging pots where their vines are allowed to trail over the sides. Honeysuckle (Lonicera) are vigorous flowering vines that tolerate heat and are easy to grow. The aromatic flowers are attractive to butterflies and hummingbirds, and the plant's fruit provide a food source for songbirds. 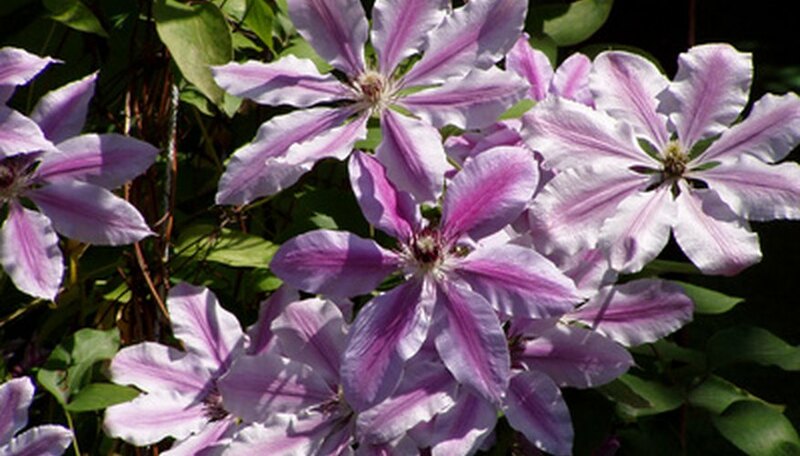 Clematis (Clematis jackmanii) produces lots of purplish-pink flowers and grows best in at least 6 hours of full sunlight per day, as long as its roots are exposed to some shade during the hottest part of the day. The trumpet vine (Distictis buccinatoria) produces trumpet-shaped flowers in spring and summer and does best if pruned yearly. Wisteria (Wisteria frustescens) is a deciduous vine that produces large clusters of white or purple flowers in late spring. It can be pruned to a shrublike shape or allowed to grow and climb. The aptly named morning glory (Ipomoea tricolor) does surprisingly well in even the poorest soils, as long as it receives adequate sunlight and moisture throughout the growing season. Morning glory vines can grow to 15 feet, producing spectacular flowers each morning that fade toward evening. Its cousin, the moonflower (Ipomoea alba), has similar growing habits, but its white blooms open at night and fade the next day. Sweet pea (Lathyrus odoratus) loves sunny spots and rewards you with sweet-smelling white, yellow, lavender or pink blossoms on vines that grow from 2 to 7 feet. The low-maintenance nasturtium (Tropaeolum) produces edible yellow, red or orange flowers on 6-foot vines, while black-eyed Susan (Thunbergia alata) is a good choice for hanging baskets and tolerates light to partial shade. For gardeners looking for climbing plants with an eye toward foliage, ivies can quickly turn a bare wall or rock formation into a living tapestry of deep glossy leaves. The most common variety, English ivy (hedera helix), is considered an invasive species in some areas, but similar varieties can be grown quite successfully in the home garden. Algerian ivy (Hedera canariensis) produces shiny leaves and vines that climb anywhere. The climbing fig (Ficus pumila) is a fast-growing evergreen vine whose leaves lie flat. It is easy to propagate by softwood cuttings and is hardy in warm southern climates, as it does not tolerate frost. Kenilworth ivy (Cymbalaria muralis) is hardy in zones 3 to 8, and produces very small blue blossoms until the first frost.